Attractive packaging and a bit of extras can't hide the fact that the local release of Japanese cult horror film Uzumaki has two key sequences censored. STEPHEN TAN tells you what you are missing. Despite the attractive packaging and extra features like the cast and crew interview and photo gallery, Singapore's Comstar's Uzumaki has two essential sequences that are censored. The first is around the 20-minute mark. A schoolboy, having a crush on one of the schoolgirls, falls to his death. What you do not see is the close-up of the body, particularly the head, and the blood flowing on the floor. Shots of this incident are featured right at the beginning of the film and, later, as a form of a flashback. But it's missing where it counts. The second key sequence is towards the end of the film where the same schoolboy is crushed under the wheel of a car (okay, the film's internal logic is a little haywire). What is shown is the car hitting the boy. What's missing is a sequence of stills showing the body twisted under the wheel. Audiences are supposed to guess from the reactions of the two leads (at the scene of the accident) that it was a horrifying accident. That it's a horrifying accident is not the point  how the body appears, wrapped up around the wheel in a spiral, is the key motif, but viewers will never see that. Looking at Uzumaki (Spiral/Vortex), you would think that the Japanese have cornered the market on weird. Based on Junji Ito's cult manga (the three-part Pulp paperback is available for US$48.85, see below), Uzumaki is about how the town of Kurouzu-cho and its people are enveloped by a series of spiral-related incidents. By the time you are though with the book, you've seen more spirals than you need to. Likewise for Higuchinsky's film. The film opens with schoolgirl Kirie (Eriko Hatsune) who is rushing to meet her boyfriend, Shuichi (Fhi Fan). On the way, she sees Shuichi's father videotaping a snail, with the focus on its shell. Then one evening, Shuichi's father discovers more joys of the spiral when he eats the spiral-designed crabcake and later meets his death when he climbs into the washing machine to have that vertigo experience. At the cremation, smoke from the crematorium turns into Shuichi's father's face and Shuichi's mother suffers a breakdown. In the hospital, in a spate of spiral-induced anxiety attacks, Shuichi's mother first cuts off the tips of her fingers as finger prints are spiral shaped, and later dies when she plunges a piece of glass into her ear when she learns that her inner ear (cochlea) is spiral-shaped. Meanwhile, some students are turning into human snails, first by appearing slimey, drinking lots of water and then having shell-like growths on their backs. Things take a drastic turn when Shuichi succumbs to the power of the vortex. 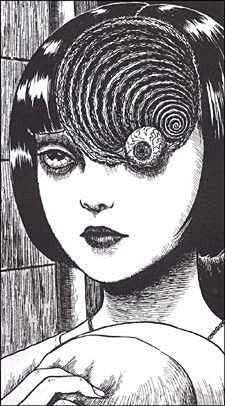 Those who are familiar with Junji Ito's manga will know that Higuchinsky was quite faithful presenting the key images  the washing machine death; the leader of the girl gang with the massive, spiral-style hair, the death at the wheel; and Shuichi's twisted body at the end (though in the manga the early appearance of the twisted body belonged to another character). 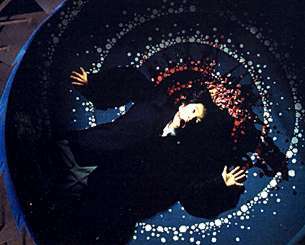 Higuchinsky's set designer too has done a masterful job with Shuichi's father's room which is filled with all sorts of spiral-related items and the computer people had a field day putting spirals all over  in the clouds, on the walls and on the floor. and every time it does, the inhabitants build their town in this shape." Or the way the film ends, which is kind of a horror cliché but one which does not explain anything  Shuichi is on the verge of attacking Kirie; the screens goes blank; and the film's opening of Kirie saying, "Kurouzu Town, my hometown. What I'm going to tell you is a strange story which took place in this town" is repeated. It may be Higuchinsky playing on the film's spiral motif  in this case, the ouroborus (the snake eating its own tail) effect to show the careening ending but it is one which leaves more questions than answers. It's sad to say that Uzumaki is effective, if one doesn't think too much about it. The cut sequences mean that the Comstar DVD is only good for those who want a taste of what Uzumaki is about. It may even create an interest in the original manga. Serious fans will probably need to search out the uncut Universe DVD from Hongkong. The colours aren't bright (Higuchinsky toned down the colours to give the film the tone of a TV movie from the '60s) but even then, the colours are slightly brighter on the Universe disc. 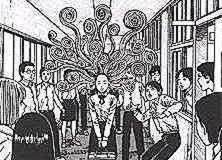 Bizarre and unusual is probably how first-time readers will react to Junji Ito's Uzumaki manga. With some liberty taken with the characters and the incidents, the film is fairly close and confined to about the first third of the manga. While offering a better look at the Uzumaki universe, the manga is generally episodic  how various characters fall under the uzumaki "spell" and how they are destroyed  with a meta-arc story about the two leads  Kirie and Shuichi  and how they are going to get out of the mess. The poignancy comes when characters whom you care about fall by the wayside, this usually not through faults of their own. The killings may be gruesome but never pointless but it is the end that Ito seems to be stuck trying to find a good resolution to the story. What really fascinates is the way Ito weaves his spiral-inspired world from ordinary things, and one will never look at the washing machine or even a piece of crabcake the same as before.